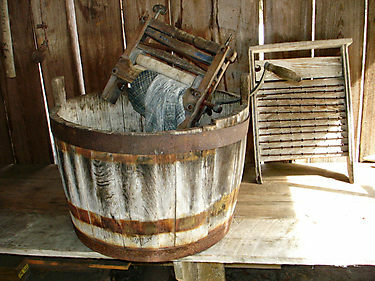 Let’s face it, laundry has changed a lot in last few decades, and thankfully so. Automatic machines, ultra fast spin cycles, timed starts, lighted interiors, load detection devices, and water sensors all help make America’s most hated chore just a little bit easier! Another thing that has changed is laundry soap, or more accurately in today’s big-box market…laundry detergent. With more and more skin rashes and conditions diagnosed in America now than ever before, many people are starting to take a long, hard, look at what we are putting in contact with our skin, and the laundry detergents we wash our clothes with are no exception. A study by the researchers at the University of Washington found that of the products studied “Five of the six products emitted one or more carcinogenic ‘hazardous air pollutants,’ which are considered by the Environmental Protection Agency to have no safe exposure level.” A direct quote from the study’s author Anne Steinemann. But you don’t really need scientific journals to tell you that these products are probably not the most safe option for your family. Just take a trip down the laundry aisle in any big-box or grocery store on Main Street, USA! You won’t even need to read the back of the boxes and bottles for your body to tell you that something isn’t quite right. Did you sneeze yet? Eyes get a little itchy? Feel a faint headache coming on? And, to think, you haven’t even touched the stuff yet. Name brand laundry detergents are some of the most highly fragranced products produced and we all know…with synthetic fragrance comes synthetic chemicals! Thankfully there are more options than just clothes filled with stains and odor and clothes filled with toxic chemicals! Old fashioned laundry bars happen to be our favorite alternative but sometimes they can leave the consumer stumped as to how to use them! Here are 4 simple tricks to using all natural laundry bars! 1. Use as a spot treatment! Most old-fashioned laundry bars can be used “dry” and rubbed directly on the stained piece of clothing as a spot treatment or pre-stain treatment just like the expensive pens and dobbers you find in the cleaning isle. 2. Use on hand-washables and delicates. In a laundry tub or sink, with warm water, use a laundry bar “wet” by lathering in your hand, like you would a regular bar of bath soap and then gently massaging the suds into delicate fabric. 3. Grate the bar right into the wash! That’s right…grab a cheese grater from the dollar store and simply rough up that laundry bar! (Add right to the load with the clothing, not to the top where liquid detergent goes!) You will need to adjust measurements based on your washing machine and size of load (ie: amount of water used) but generally 1 tablespoon of grated soap per load is a good place to start. Bonus Tip: Grate an entire bar at once and store in a mason jar at room temperature so you don’t need to grate before every load! 1. Grate down an entire laundry bar from the Amish Country Soap Co in your choice of Unscented, Lavender, or Lemongrass. 2. In a large pot, bring 4 cups of distilled water just to the point of boiling. 3. Add the grated laundry bar to the water. 4. Turn down heat. Do not let the mixture boil. 5. Stir constantly until all of the shaving of soap are dissolved. 9. Use a wisk or stick blender the next morning if any lumps have formed. Work mixture until smooth and silky. 11. Use as regular laundry soap, approx. ¼ cup per load. Makes enough liquid soap for approx. 30 loads. To shop all of our Old Fashioned Laundry Bars CLICK HERE!